On June 2nd, I trapped what I assumed was a worn dichrorampha sp (I have only ever had a single Dichrorampha acuminatana in the garden). 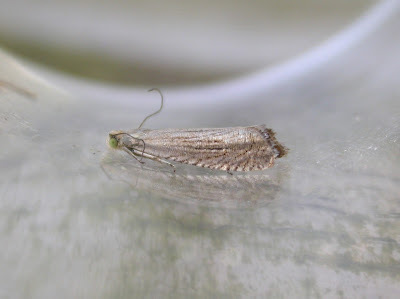 I sent it to Peter Hall for checking and with many thanks to him, he identified it as Grapholita caecana - I've not had any Grapholita sp in the garden before. Actually, the photo I took is quite a good resemblance to pictures on the net, so I should have spent more time on it. This is a proposed Red Data Book species and a first for VC24. Its habitat is chalk grassland, which I suppose is around my area, though I would define my garden as semi-rural woodland edge, so presumably a wanderer.